It’s one of those healthy buzz words plastered on food labels everywhere to make the food you eat more appealing. But studies have shown the consumption of whole grain foods, versus those with refined grains, can provide a much greater health benefit when properly added to your everyday dietary regimen. Whole grains are high in fiber and contain phytochemicals and antioxidants that, according to the Journal of Nutrition, have been linked to a reduced risk of several chronic illnesses such as heart disease, stroke, and type-2 diabetes. Whole grains also play a vital role in healthy weight management and gastrointestinal health. But what exactly is whole grain, and how can we tell if what’s on the food label is accurate? 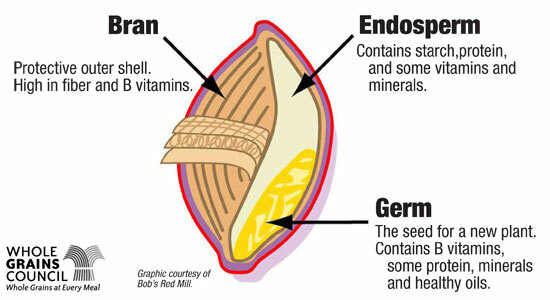 Well, there are three components to whole grain – the outer Bran, Endosperm, and the Germ. All grains start out as whole grain, but the refining process typically removes the outer Bran and Germ portion to give the grain a better texture and preserve its shelf life. The downside to grain refinement is that what’s left remains only the inner Endosperm which contains mostly complex carbohydrates and only a few of the essential vitamins and minerals. A few good sources of whole grain include Barley, Buckwheat, Quinoa, Rice (both brown and white), Rye, and Corn. In order for foods to be labeled as whole grain, the USDA requires that at least 8g of whole grain content be in each serving. The US dietary guidelines suggest that at least half of our daily serving of grain be from these whole grains – that comes out to about 3-5 servings of whole grain each day!